BigWig [ ˈbigˌwig ] (noun): an important person, usually in a particular sphere; synonym:VIP · (very) important person. We have asked eight Dallas community and business leaders to don pink wigs from February 20th through March 31st and represent Komen Dallas County throughout the community. They all have a special tie to the cause and they are all committed to doing their part to end breast cancer forever by committing to raise at least $1,000. Be a part of the fun and help us reach our fundraising goal of $16,000. 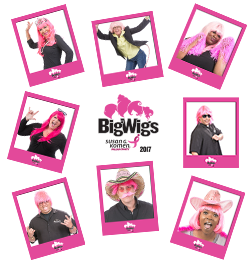 Visit our BigWigs webpage today, pick your favorite BigWig, and DONATE! What started as a promise between two sisters has blossomed into our mission to save lives by meeting the most critical needs in our communities and investing in breakthrough research to prevent and cure breast cancer. 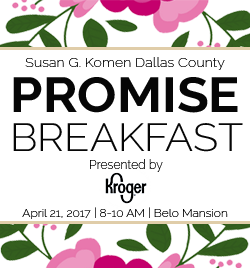 Come see our mission in action on Friday, April 21st as we honor and celebrate our 2017-2018 Community Partners, who provide vital life-saving breast health programs to the uninsured and underinsured residents of Dallas County. Learn from experts in the breast health community about the state of breast cancer in Dallas County and the research being conducted in Texas to find the cures for the disease that will take the lives of over 40,000 people in the United States in 2017. 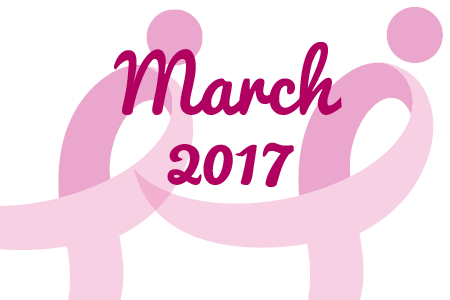 March is the last month of our fiscal year and we are asking you to be More Than Pink™. 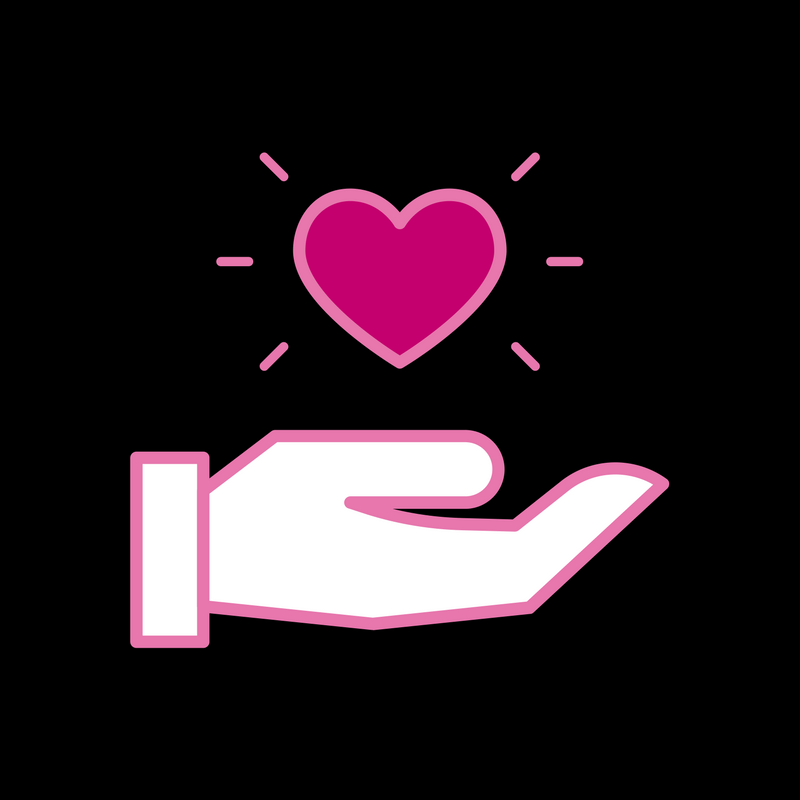 With your donation, Komen Dallas County can fund more life-saving resources so our neighbors won’t have to go without. You can DOUBLE your donation and impact today! Auto Liquidators will generously match each donation up to the first $2,500 we receive during our Fiscal Year End Campaign. Does your employer match donations? If so, when you give today, your gift could even be TRIPLED! 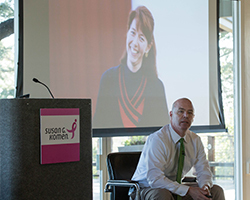 Gary Thompson, co-founder and CEO of CLOUD, Inc., spoke to attendees of Komen’s Big Data for Breast Cancer – West Coast meeting to share what provokes and pushes him in his efforts to use Big Data to improve cancer care. The potential for Big Data in breast cancer is virtually endless – literally the world at your fingertips. Imagine what could happen to the pace of research if scientists had access to data from thousands of laboratories and research studies worldwide. Imagine if they could share their data – the successes, failures and even the dead ends. Collaboration through Big Data has the potential to avoid potentially duplicative research, speed up the pace of promising research, and bring solutions to patients sooner. Thompson lost his wife in 2014, but hopefully with the advancement of Big Data, one day we will have a world without breast cancer, and others won’t have to experience this devastating loss. Did you know that the breast cancer mortality rate experienced by Black women is 1.4 times higher than the combined rate for all women living in Dallas County? The late stage diagnosis rate for Black women in Dallas County is 1.2 times higher than the rate experienced collectively by all women in the county. Based on the Affiliate’s 2015 Community Profile, some target areas were identified to help address these disparities. Those areas are: Cedar Hill, Desoto, Lancaster, and South Dallas. We believe that where you live, should not determine whether you live, with regards to breast cancer. Because of the unacceptable numbers both locally and nationally, among African American women, Susan G. Komen® has targeted 10 U.S. cities with the greatest disparities, as a part of the African-American Health Equity Initiative. Dallas, TX will be one of the targeted cities. More details will come. We are exploring the concept of having a local African American Health Equity and Education Committee to help reduce the breast cancer mortality rate, and the late stage diagnosis rate experienced at a higher level by African American women in Dallas County. This committee would serve to help initiate, implement, and support activities that will help achieve Komen’s bold goal of reducing current breast cancer deaths by 50 percent by 2026. If you or anyone you know would be interested in serving on the Committee, please contact Aisha Heath at aheath@komen-dallas.org or 469-619-3906.